Meet your new "go to" furniture glide! Desunia Super Sliders are inexpensive, install in seconds, and durable enough to outlast whatever you put them on. But the thing that will make your purchase one of the smartest you've ever made, is how their self-lubricating feature will make your furniture seem as if it were floating on air! Use them on chairs, tables, benches, or any furniture that you'd like to easily and quietly move, all by yourself! While not recommended for linoleum or floors that have "give", you're going to LOVE how they perform on tile and hardwood surfaces. But don't stop there, take them outside and make your patio furniture 10x easier to move around. 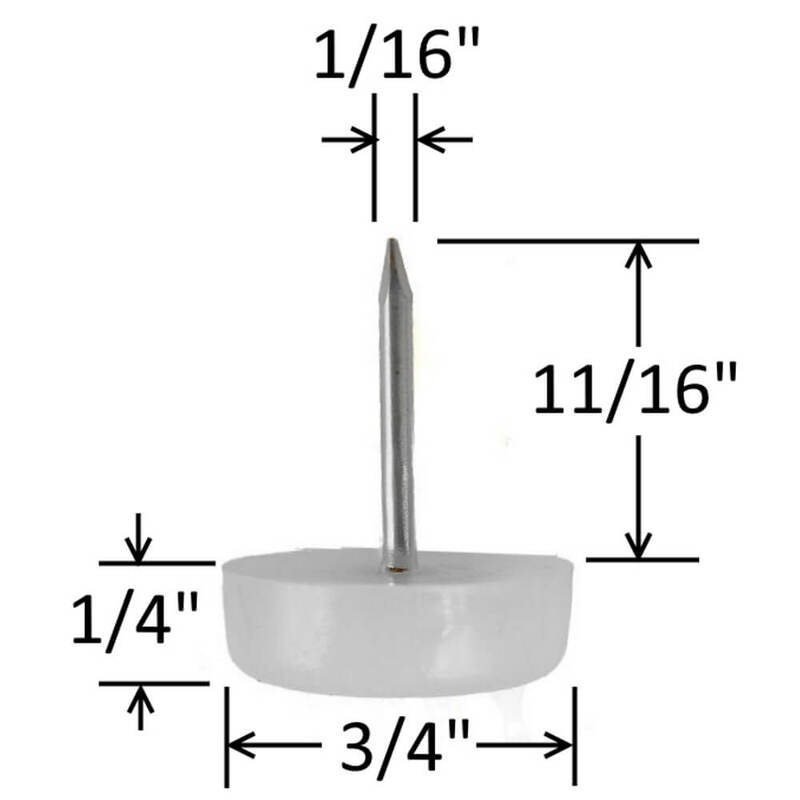 Glides measure 5/8" in dia. x 1/4" thick. Rounded edges help them skim them over minor obstacles (like uneven tiles). Nails are 11/16" long x 1/16" wide. White color compliments any decor. Forget poly bags or those diabolical clamshell cases! Our Super Sliders come in handy cardboard boxes, making them easy to open and simple to store any extras. Better for the environment too! - Don't try to bang them in with a single blow. Better to use a bunch of light hammer taps. - Pre-drilling is advisable with harder woods. - For larger areas (like sofa legs) use multiple sliders. - If replacing existing glides that had a larger diameter nail, prep the hole with a toothpick and a dab of glue.